Some anti-republican commentators and historical revisionists, are often quick to dismiss the act of hunger strike, advising that these noble patriots were desperate and misguided. At every turn, we must reject such commentary and remind all who wish to learn of these brave men, of the political and historical backdrop as to why such radical decisions to go on hunger strike were made. Some names memorialised here are perhaps better known than others, such as the ten men who died in 1981 in the H-Blocks. One of the greatest minds of Irish republicanism, and the first to die on this strike for the Five Demands in 1981 was Bobby Sands. On the first day of his hunger strike, Sands began a diary of his experiences. Even at what he calls 'the threshold of another trembling world' Sands' bravery and republican vision shines through. He writes: 'I am a political prisoner. I am a political prisoner because I am a casualty of a perennial war that is being fought between the oppressed Irish people and an alien, oppressive, unwanted regime that refuses to withdraw from our land. Sands articulates here exactly what a republican prisoner is, that they are political prisoners, they are in jail because of their opposition to British rule, they are part of the overall republican movement to remove this British interference in our country, that their struggle in jail is part of the wider struggle for Irish Independence. Prisons are, and remain, an important battleground for Irish republicans. As true today as it was in the days of the United Irishmen. Over the centuries, many men and women imprisoned for the cause of Irish Freedom have displayed great physical and mental endurance in their capacity to resist. Their heroism and bravery is an important part of the fight for Irish independence and we will always honour their memory. 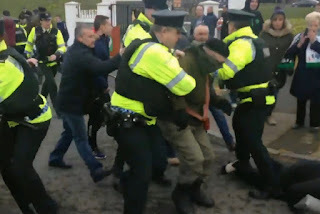 The vicious and vindictive treatment of Irish Republican prisoners at the hands of the British Government in Ireland is something that we as Republican have always insisted upon challenging, right up until the present day. The barbarity against republicans is no better exemplified than the abuse at British hands, of the Hooded men. 14 men who were interned in 1971 of which now only 8 survive, taken to a secret torture centre and while there experienced the most degrading and inhumane torture, from which they have never recovered. These men where hooded, starved of food and water, exposed to white noise, made stand for hours on end in stress positions and sleep deprived, the illegal torture they endured is known as the five techniques, as if all this wasn’t bad enough, these men were also subject to the most brutal of beatings. All of these men were interned, none of them faced charges. Such was the intensity of the torture, their case was brought to the European court of Human rights, in April of this year it was wrongly decided there, that it did not constitute torture, in recent days the Freestate Government have confirmed that they will now appeal this decision. I think I speak for all of us here today, when I say we support the hooded men’s quest for Justice 100% and that we are behind you all the way. I strongly urge all present here today to support Tony and his family in their continued efforts and protests to highlight his internment. The criminalisation of Republican prisoners continues to be British policy, but they are not alone, let us not forget that the Freestate government has been equally harsh on Republican Prisoners, that they too have engaged in internment and torture of Republicans. Nearly three decades before the deaths of Frank Stagg and Michael Gaughan in England on Hunger Strike, the former IRA Chief-of-Staff Seán McCaughey would die on the 23rd day of his hunger and thirst strike in Portlaoise prison. That his death, and the deaths on hunger strike several years previous of Seán McNeela and Tony D'Arcy, happened on the watch of a Freestate Fianna Fáil government headed by Eamon de Valera must never be forgotten. The deaths of these great patriots of the 40s are but a few, tragic examples of the determination of the neo-colonial Free State government to crush Irish republicans - it is offensive to their memory and the republican cause to regard government seats in Leinster House as legitimate or the path to Irish freedom. 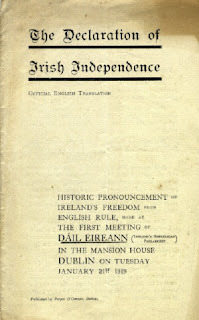 Those patriots of the 1940s recalled well, there had been a counter-revolution of barely two decades before, when Irish republicans fought to defend the Irish Republic from the Free State. We are often told this Civil War ended with the IRA order to 'dump arms' in May 1923. While that ended the military phase of the conflict, what is little appreciated is that by the end of 1923, 12000 republican prisoners remained in Free State jails. In October 1923, thousands embarked on a hunger strike, resulting in the deaths of Volunteers Joseph Whitty, Denny Barry and Andy O'Sullivan. It is important towards the end of this often sanitised 'decade of commemorations' that we do not diminish the sacrifice of the men who battled to oppose the Free State coming into being - and we republicans must challenge the notion that the fight for an Irish Republic ended with the counter-revolution of 1922-23. 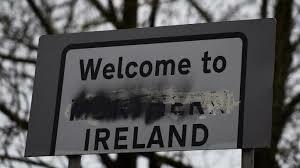 Today, we are living through a difficult period for Irish republicanism, in which it may be seen, that many across Ireland are indifferent to the concept of Irish freedom not to mention the continued existence of partition. Many ordinary people across Ireland are led to believe the political institutions are the only means of change and this leaves many without hope, and indifferent to any form of politics. It is, therefore, the challenge for Irish republicans to present to the Irish people a radical alternative to the status quo, and empower them with the belief that an independent Irish Republic will change their lives for the better. Our gathering here today shows that are still those of who find common cause, to say nothing of the support we have from others who are unable to be present. All republicans, whether we are independent, or aligned with a group, must recognise we share common principles and goals. To come together and allow for robust debate amongst republicans will of course be difficult, but is pivotal if republicanism is to endure in the times ahead, and if we are to convince the people of the need, for the re-establishment of the actual Irish Republic. And it is the re-establishment of the Irish Republic that we must fight for, I have little faith in the British and Free State governments 'border poll' idea, the proposed national set up, in the unlikely event that a border poll would succeed is not what we envisage as the Republic. We all have different ideas of what kind of government the Republic will be, I myself favour a federal concept, while others favour other models, what we all must agree on however, is that as Republicans we should have no truck with the idea of a 32 county Freestate. It is apt to note, that in recent days the Freestate and Stormont administrations have played host to British Royals, British Prince Charles and his wife Camilla, for 4 years in a row now have visited Ireland. The spectacle of Gerry Kelly and other PSF members, standing in line to shake Charles’ hand was nauseating, while Mary-Lou and Michelle O’Neill were hilariously pictured with Prince Charles, both with wide childish grins on their faces like two teenage girls who had just met their pop idol. But none of this is surprising to us, the late Martin McGuinness started the trend of Royal Deference back in 2012 when he too shook the British Queens hand, and in a more flamboyant act of sycophancy, standing for a toast to the British Queen, as an orchestra played “God Save the Queen” at a State banquet in Windsor Castle in 2014. While PSF and other Freestate and British ministers were busy entertaining the British Royal delegation, Republicans were rightly protesting in Kerry against their visit, these Republicans must be commended for this action, we must not allow British Royal Visits to become normalised, the massive Security Operation both north and south highlighted that there is nothing normal about British Royal visits. While British rule remains, they will never be welcome. Finally, it is right that we recognise Duleek Monument committee who maintain this beautiful garden, we are grateful to all those who built this fitting memorial, to remember the heroism and sacrifice of these great men, this garden inspires us to remember the deeds, and heed the words, of Irish Patriots. May we carry the memory of the 22 hunger strikers with us always, as we continue the struggle for the Irish Republic.